While authoring my forthcoming book, Maximizing School Librarian Leadership: Building Connections for Learning and Advocacy, I have read many professional books. This is the ninth in a series of professional book reviews–possible titles for your professional reading. The reviews are in no particular order. As an advocate for inquiry learning, I am in total agreement with Dan Rothstein and Luz Santana: student-led questioning is an effective way to guide students into deeper learning. When students (or adult learners, for that matter) are invested in finding out why, they are more motivated to pursue answers to their questions and solutions to the world’s pressing problems—especially when the answers are illusive, the process is difficult, and the outcome is uncertain. 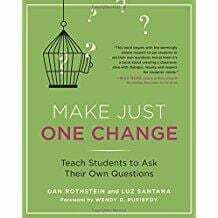 In their book Make Just One Change: Teach Students to Ask Their Own Questions, authors Dan Rothstein and Luz Santana note that student-led questioning helps ensure that students are learning and practicing thinking skills. Rothstein and Santana are the directors of the Right Question Institute (RQI), a 501(c)(3) educational non-profit organization. They developed the Question Formulation Technique™ (QFT), which involves students in brainstorming questions as a way to launch an investigation. All students’ contributions are accepted and weighted equally. The question recorder documents all questions verbatim as asked without comment, response, or discussion. Statements are turned into questions as well. Students then prioritize questions to determine which are most compelling; their priorities set the learning agenda for the next class period (or subsequent lessons). Educators can guide students in other types of questioning processes such as Question the Author (Beck, McKeown, Sandora, Kucan, and Worthy) during which students discover various aspects of the writer’s and illustrator’s craft as well as persuasive techniques and bias. When readers question the texts they encounter, they are engaged in an active learning process that has the potential to increase their content knowledge as well as improve their overall reading proficiency. Questions are a way for students to uncover the gaps in their understanding. Questioning can also help them identify misconceptions. The ability to question, whether applied to reading and responding to literature, identifying bias in a political cartoon, or analyzing data in a scientific journal article, is an essential, lifelong-learning skill. That said, my experience tells me that educators who are teaching future-ready students need to do more than just this one thing to help prepare students for today and tomorrow. Honoring students’ agency and helping them explore their interests through student-led questioning is an essential and critical place to begin. Inquiry learning can be an essential part of the next steps, the “more” that future-ready students need. Beck, Isabel L., Margaret G. McKeown, Cheryl Sandora, Linda Kucan, and Jo Worthy. “Questioning the Author: A Yearlong Classroom Implementation to Engage Students with Text.” The Elementary School Journal, vol. 96, no. 4, 1996, pp. 385-414. Rothstein, Dan, and Luz Santana. Make Just One Change: Teach Students to Ask Their Own Questions. Cambridge, MA: Harvard Education Press, 2015. This entry was posted in Professional Book Reviews and tagged instructional leadership, Reading success by Judi Moreillon. Bookmark the permalink. Thank you, Judi for a thought-provoking discussion of our work. We agree with you that good teaching involves far more than ‘just one change.’ Our hope is that teachers can use the Question Formulation Technique, and by making that one change, make the hard work of good teaching a bit easier! Feel free to drop the “TM” from the QFT. Everything’s available now via Creative Commons.